An End of Summer Short Newsletter I'll keep this one brief, but I wanted to make sure we checked in with all of you. I hope you had a great summer, and those of you in the northern climates (like us up here in Maine) are enjoying the fall foliage. It will soon be winter in our area, a good time to practice the piano more often. The next newsletter will have more content, speaking of which we're always looking for ideas to include in the newsletter (articles, stories, fun stuff, upcoming concerts and competitions, good threads, etc. Doug Johnson, Berklee School Jazz piano professor will teach a clinic from 1:30 to 3pm and then from 4pm to 5:30pm will give us a Jazz Piano Concert. Refreshments will be offered during the one hour break. I hope everyone will attend, it helps us continue to bring these events. Stay tuned, putting the final touches on an early Nov perf. from a very well known NYC performer !!! Keith Emerson Playing in NY! Details Keith Emerson Jeffrey Biegel Concert! The best haunted happening in New England! Kathy and I have the privilege of being part of the team this year and we couldn't be more excited! If you'd like to experience a truly haunting Halloween experience, this is the one. A huge team of volunteers turns this 19th century school into one of the best haunted houses you'll ever see. And if that isn't enough to spook you, you should know that the place is considered by many to actually be haunted (I've already "met" a few of the inhabitants). This years theme is The Adams Family invites The Munsters (and assorted other goulish friends). 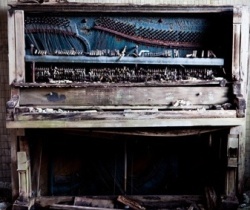 And it does tie in with music, because I will be playing the organ - - - as The Phantom of the Opera! Kathy will be Lily from The Munsters. An annual event in Parsonsfield is frightening even for those old enough to know better. 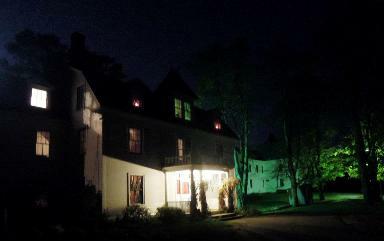 Halloween is scarier than usual at "The Haunting" at Parsonsfield Seminary. It is a beautiful 19th-century campus that lives and breathes in secluded solitude. Grown men hired to work on the building alone have been known to leave the grounds never to return for the feeling of "being watched." Now available in our online store.